When I was a teenager, especially after Nine Inch Nails became really popular, I kept hearing about a band named Ministry. I knew they were industrial and heard a few of their songs but they weren't really what I was looking for at the time. Several years later I heard more of their music and became a fan. Though hated by Ministry frontman Al Jourgensen and most Ministry fans, their debut album With Sympathy is one of my favorite albums of all time (I would probably call it my favorite synth pop album ever made). I do like their later, harder industrial music a lot too and that is what you hear in Fix: The Ministry Movie. I've heard rumors about Jourgensen's sordid past but never in great detail (nor could I tell if any of it was even true). Well, with this new documentary film, I learned that the rumors are true...and they're not pretty. Fix: The Ministry Movie is mainly a tour documentary featuring backstage and on stage footage of the band from their 1996 Sphinc-tour. The film also features recent interviews with many of hard rock's biggest names including Trent Reznor (Nine Inch Nails), Lemmy (Motorhead), Maynard James Keenan (Tool), David Yow (The Jesus Lizard), Dave Navarro (Jane's Addiction) and more. The film focuses mainly on frontman Al Jourgensen's wild behavior and drug addiction, as well as how influential his music was and still is. Only in today's culture where no one's lives are private, especially those with a large following would we ever see a film like Fix. Nothing is censored, nothing is cut out, nothing is taboo. 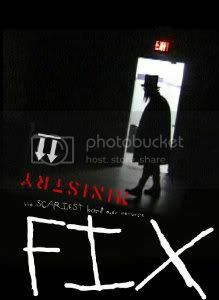 Fix graphically shows real life...at least in the world of Al Jourgensen. We see the artiste shooting heroin, penetrating a cooked turkey about to be served to the road crew, overcome with paranoia and lots of other scary things. We also hear stories about Jourgensen from those who know him and many of those are just as scary (the worst of which is told by David Yow of The Jesus Lizard who we also see completely naked several times throughout the film). Fix is shocking, disgusting, raw, honest and brilliant. The fact Jourgensen allowed this to be released says a lot about him, which you will learn after watching the film. Just released by CAV/Blairwood Entertainment/Gigantic Pictures, this DVD also comes with a CD of Industrial/Ministry-like songs from former Ministry member Paul Barker featuring Taylor Momsen, Nivek Ogre, Chris Connelly, USSA, Alexis S.F. Marshall and Jeffrey Kinart.